The Perfect Gift is made-up from three separate, handcrafted and unique gifts. A delightful, endearing pen drawing in a decorated wood and glass frame. A unique Greeting Card, designed specifically for the occasion. A set of 30 personalised labels, including the same picture theme and with text appropriate for its use - there are a variety of ways in which you can utilise these unusual labels. 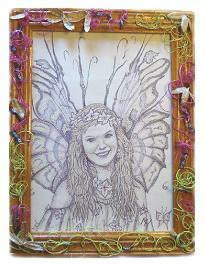 Any occasion can be celebrated with The Perfect Gift - an original and unique expression of love that can also be a bit of fun - why not surprise your mum or dad with a framed drawing, a greeting card and labels with her/him depicted as a fairy/elf, created from a photo when they were younger ! That's all we need ..
people or pets, that have meaning and value to you, can be transformed into a delightful piece of art that will give lasting pleasure.